Subtasks are a great way to document your plan to complete and release a ticket on your board. 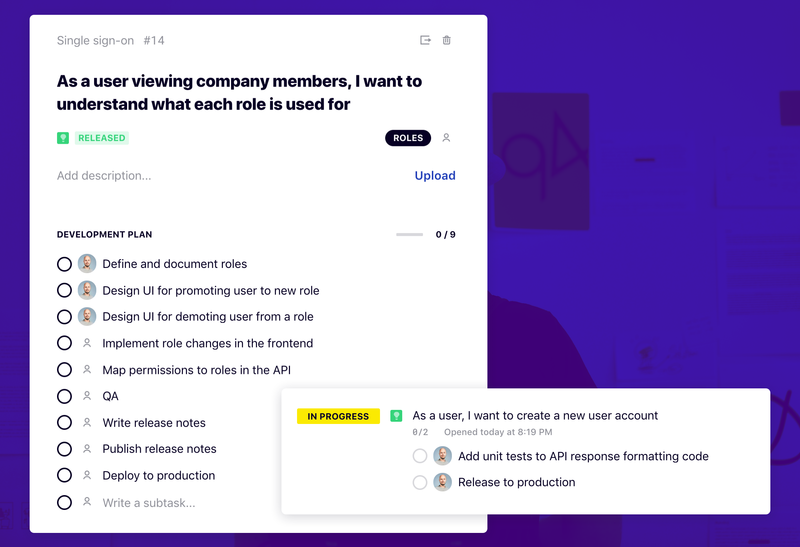 In ProductBeat, subtasks are the lowest-level way to break down the work and features your product needs. Your backlog should mostly consist of stories, bugs and or support requests that communicate a complete feature that your product should have, or a problem that needs to be solved for end-users. Often it makes sense to make a clear plan on how to solve them, as well as document activities such as QA, stakeholder reviews and release deployments. Subtasks under the Development plan header is the way to do this effectively. Your development plan is visible along with ticket details throughout the app. Subtasks are easy to edit with the familiar checklist interface. You can check a subtask to mark it done, and assign it to anyone in your team just like tickets. You can reorder or edit the list freely. To remove a subtask, just clear the task title and press enter. Subtasks are completely optional, but when you have multiple team members and a want to enforce consistent development flow with certain important steps, it makes sense to use them. Before a refined ticket is moved to in progress, write down a development plan with the team. It might be a good idea to do it in a separate setting from the refinement to separate the problem space from the solution space.